John Walter PATTERSON was born on 13 Jun 1913 in Fort Mill, York, South Carolina. He died on 10 Jun 1989 in , , South Carolina. John married Tressie TOTHEROW. Tressie TOTHEROW [Parents] was born in 1919 in , , Georgia. She died in , , South Carolina. Tressie married John Walter PATTERSON. MOORE. MOORE married Dorcus TOTHEROW. Dorcus TOTHEROW [Parents] was born about 1929. Dorcus married MOORE. PUGH. PUGH married Faye T. TOTHEROW. Faye T. TOTHEROW [Parents]. Faye married PUGH. HARGETT. HARGETT married Ruby T. TOTHEROW. Ruby T. TOTHEROW [Parents]. Ruby married HARGETT. Jack MC GRAW. Jack married Laura Charity HOLLINGSWORTH. Laura Charity HOLLINGSWORTH [Parents] was born in 1856 in , Christian, Illinois or Vermillion County, Indiana. She died on 16 Aug 1925 in Kansas City, Jackson, Missouri. Laura married Jack MC GRAW. Albert WILLBANKS was born on 23 Mar 1905. He died on 15 Sep 1969. Albert married Minnie HOLLINGSWORTH. Minnie HOLLINGSWORTH [Parents] was born on 24 Feb 1904 in Oakland, Marion, Arkansas. She died on 12 Oct 1939. Minnie married Albert WILLBANKS. Seiver S. SHANNON [Parents] was born on 17 Jan 1838 in , , Missouri. He died in Between 7 Jan & 25 Sep 1873 in , Grayson, Texas. Seiver married Susan Caroline HARTZOG on 17 Jul 1864 in , Montague, Texas. Susan Caroline HARTZOG was born on 24 Dec 1842 in Van Buren, Crawford, Arkansas. She died on 20 Apr 1871 in Sherman, Grayson, Texas. 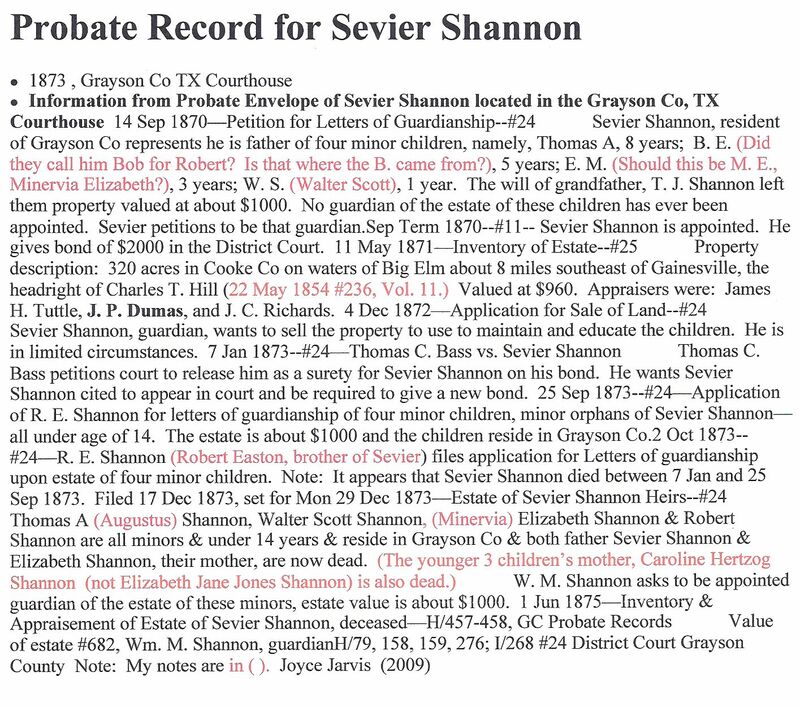 Susan married Seiver S. SHANNON on 17 Jul 1864 in , Montague, Texas. Minervia Elizabeth SHANNON was born on 2 Mar 1867 in , Montague, Texas. She died in Possibly, , , Idaho. M iii Walter Scott SHANNON was born on 17 Oct 1869. He died on 23 Nov 1946. Mary Susan Catherine SHANNON was born on 11 Apr 1871 in , Grayson, Texas. She died in Apr 1871 in , Grayson, Texas. Alexander CAMPBELL was born in 1843 in , , Arkansas. Alexander married Susan Caroline HARTZOG in 1860. Susan Caroline HARTZOG was born on 24 Dec 1842 in Van Buren, Crawford, Arkansas. She died on 20 Apr 1871 in Sherman, Grayson, Texas. Susan married Alexander CAMPBELL in 1860. Jefferson Matison CAMPBELL was born on 1 Aug 1860 in , Grayson, Texas. Charles Alexander CAMPBELL was born on 10 Jun 1861 in , Grayson, Texas. Frank RICHARDS was born about 1930 in , , Tennessee. Frank married Julia Ann SHANNON on 29 Dec 1852. Julia Ann SHANNON [Parents] was born in Jun 1935 in , Boliver, Missouri. She died on 27 Nov 1922 in Sherman, Grayson, Texas. Julia married Frank RICHARDS on 29 Dec 1852. Walter Scott SHANNON [Parents] was born on 17 Oct 1869 in , Grayson, Texas. He died on 23 Nov 1946 in Vernon, Wilbarger, Texas. Walter married Adaline Belle CAULEY on 10 Sep 1891 in , Greer, Texas. Adaline Belle CAULEY was born on 13 Sep 1872 in , Collin, Texas. She died on 10 Sep 1951 in Vernon, Wilbarger, Texas. Adaline married Walter Scott SHANNON on 10 Sep 1891 in , Greer, Texas. Gracey SHANNON was born in 1891 in , , Texas. F ii Maude E. SHANNON was born on 11 Jun 1893. She died on 23 Mar 1981. M iii Roy Easton SHANNON was born on 7 Sep 1894. He died on 1 Nov 1980. F iv Mary Margaret SHANNON was born on 6 Aug 1895. She died on 15 Mar 1988. Julia Ruth SHANNON was born on 14 Oct 1896 in Tishomingo, Johnston, Oklahoma (Indian Territory). She died on 14 Apr 1899. Cauley Lee SHANNON was born on 21 Feb 1899 in , Grayson, Texas. He died on 28 Apr 1899. Elmer L. SHANNON was born on 21 Jun 1900 in Blue, Bryan, Oklahoma (Indian Territory). He died on 27 Aug 1900 in , , Oklahoma (Indian Territory). Zelma R. SHANNON was born on 21 Jun 1900 in Blue, Bryan, Oklahoma (Indian Territory). She died on 11 Aug 1900. Walter Clarence SHANNON was born on 10 Oct 1901 in , , Oklahoma (Indian Territory). He died on 16 Aug 1902 in , , Oklahoma (Indian Territory). M x William Scott SHANNON was born on 7 Sep 1904. He died on 9 Oct 1964.